Du wahrer Gott und Davids Sohn (You true God and Son of David), BWV 23,[a] is a church cantata by Johann Sebastian Bach. He composed it in Köthen between 1717 and 1723 for the Sunday Estomihi and performed it as an audition piece for the position of Thomaskantor in Leipzig on 7 February 1723. 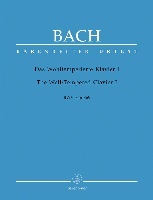 Bach probably composed the cantata in Köthen between 1717 and 1723 for Quinquagesima Sunday (also known as Estomihi), but it was revised to be included as Bach's other test piece (with Jesus nahm zu sich die Zwölfe, BWV 22) for the position of Thomaskantor in Leipzig. The work was performed there on 7 February 1723 (after the sermon), and performed again on 20 February 1724. It is unclear whether a "test" performance of the 1723 revised version took place in Köthen before Bach's audition at the Thomaskirche. 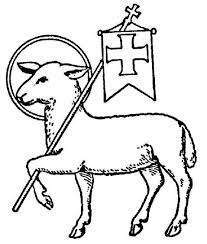 The chorale theme Christe, du Lamm Gottes first appeared in print in Johannes Bugenhagen's Braunschweig church order, published in Wittenberg in 1525. The theme is an adaptation of Luther's setting of the Kyrie eleison in his 1525 Deutsche Messe. In this cantata, Bach combines elements of ritornello and concerto writing to expand his range of structural experimentation. Although the chorale was a later addition, its melody is incorporated earlier in the piece. The text's theme is optimistic, but the music throughout has a sense of underlying sadness. Craig Smith describes the cantata as "one of the densest and greatest". 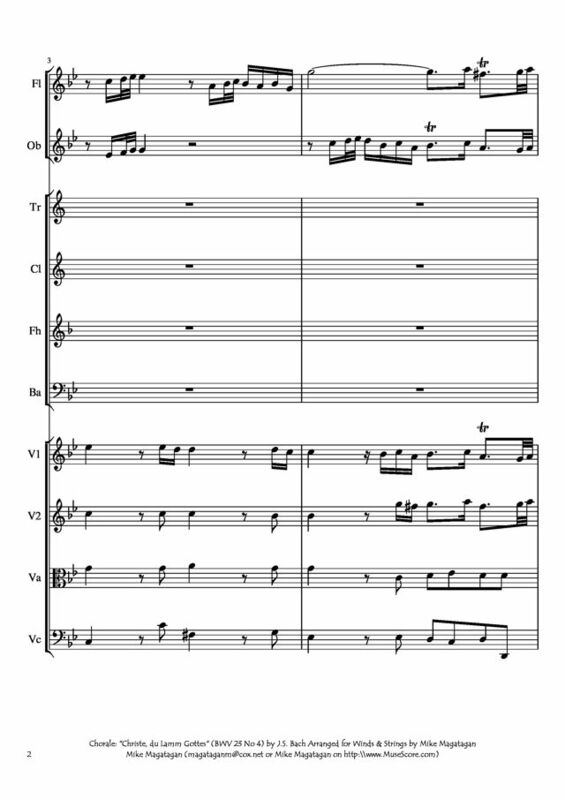 The opening movement is "a sinewy and somewhat enigmatic quintet" for soprano and alto voices (assuming the role of the blind man addressing Jesus) with low active oboes and continuo. The movement is in adapted ternary form with an opening and closing "Italianate" ritornello. The soprano line includes a "drooping" motive, hinting at later harmonic and emotional development. There is a "thorny, even awkward juxtaposition of triple and duple meters" throughout the duet. The tenor recitative is quite similar to that for bass in BWV 22: they are in major and use chordal strings underlying the vocal line. 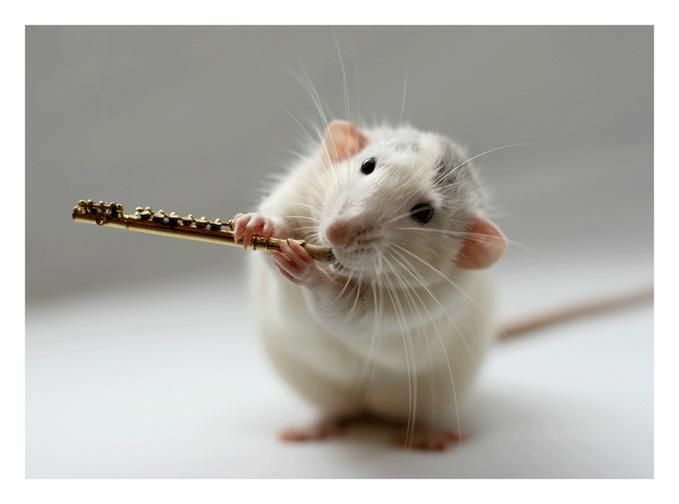 This movement adds an instrumental rendition of the melody of the closing chorale in oboe and violin. The chorus is "dance-like but not toe-tapping, major but not ebulliently so, employing the full chorus but restrained throughout". The form is free rondo with interspersed extended episodes of tenor and bass duet. The opening includes the BACH motif. 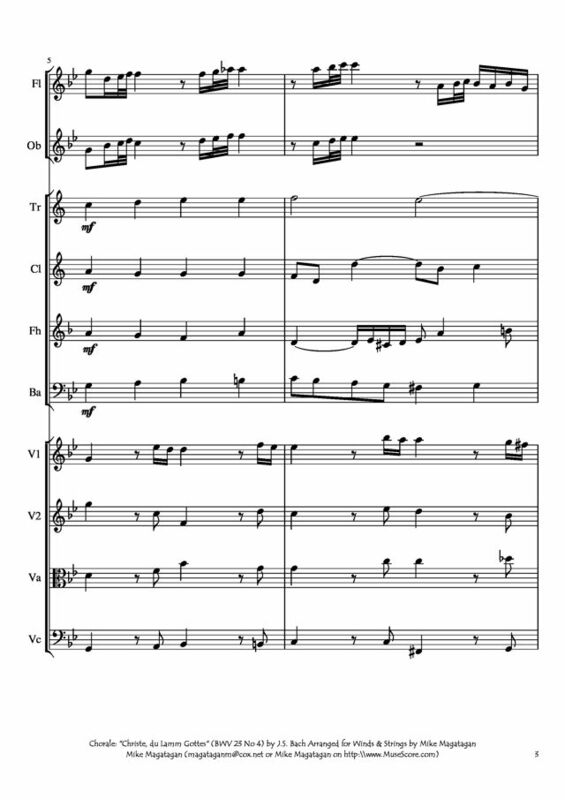 The cantata is scored for three vocal soloists (soprano, alto, and tenor), four-part choir, cornett, three trombones (or trombe), two oboes, two violins, viola, and basso continuo. The piece has four movements. 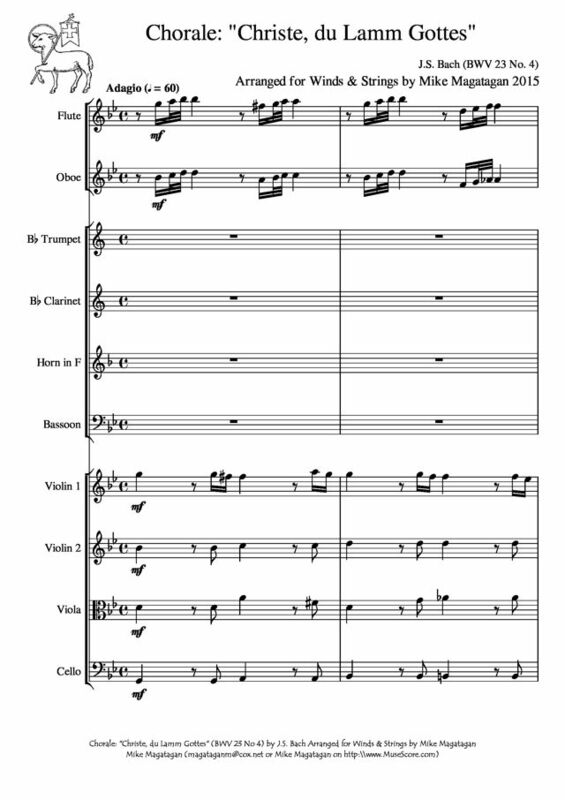 I created this arrangement of the final Chorale: "Christe, du Lamm Gottes" (Christ, Lamb of God) for Winds (Flute, Oboe, Bb Trumpet, Bb Clarinet, French Horn & Bassoon) & Strings (2 Violins, Viola & Cello).